Duterte to Mangudadatus of Maguindanao: Saludo ako sa kanila! President Rodrigo Roa Duterte attended the PDP-Laban South Cotabato Campaign Rally last Tuesday, March 26, 2019 held at the South Cotabato Sports Complex. With all the members of PDP-Laban's "MABAGOKOTO" senate slate namely - Zajid “Dong” Mangudadatu, Ronald “Bato” de la Rosa, Bong Go, Aquilino “Koko” Pimentel and Francis “Tol” Tolentino present during the rally, the president urged the people to give their full support to all his candidates. 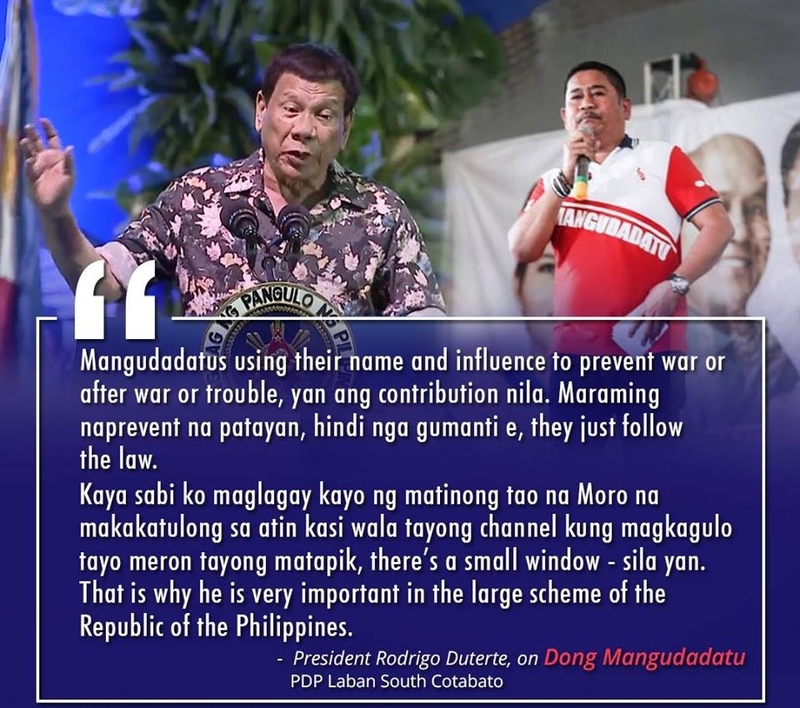 In his speech, he particularly praised Congressman Dong Mangudadatu and his family for their efforts and initiatives in restoring peace and order, and bringing developments in Maguindanao Province. "They never took arms against their government or even threaten to go to war.. they stood fast na talagang Pilipino sila. Saludo ako sa kanila".. said the president. "The Mangudadatus are using their name and influence to prevent war or trouble, yan ang contribution nila. Maraming na-prevent na patayan, di nga gumante e, they just follow the law. Kaya sabi ko maglagay kayo ng matinong tao na Moro na makakatulong sa atin.." added President Duterte. Guest candidates of PDP-Laban namely Sen. Cynthia Villar, Sen. Pia Cayetano, Sen. Sonny Angara, Sen. JV Ejercito, Gov. Imee Marcos, and Raffy Alunan also graced the PDP-Laban South Cotabato Campaign Rally which according to the PNP was attended by around 6,000 people including local officials from different towns of South Cotabato, neighboring Sultan Kudarat, Sarangani, Maguindanao and General Santos City. Senator Manny Pacquiao also attended the event. He is the national campaign manager of PDP-Laban.